new/old genre. One of those titles didn't quite fit the mold, and it spawned a hero that didn't fit the mold either. Amazing Adult Fantasy ("adult" denoting maturity of taste, not necessarily of legal status), which showcased the unconventional art of Steve Ditko (as directed by writer/editor Stan Lee), was the birthplace of Spider-Man. The adjective which, to this day, is titularly associated with the hero is a reference to that place of origin. Spidey didn't seem engineered for success. For one thing, the motif was questionable ("spiders — ewww!"). For another, the comic he debuted in, never a high seller, was about to be cancelled. Re-titled Amazing Fantasy in a last-ditch effort to expand readership by not appearing restrictive, it ended with #15 (August, 1962) — the very same issue that contained Spidey's debut. The character would have sunk straight into oblivion, had the fans not emphatically — and unexpectedly — demanded more. Apparently, a lot of people found something to identify with in Peter Parker (Spidey's secret identity). He went into regular publication with the March, 1963 releases. Peter started out as an embittered wimp, the kid everybody in school picked on. When he became super-powerful (by being bitten by a radioactive spider), it never entered his head to become a superhero. Instead, he used his power to cash in. He became a superhero only after his not bothering to stop a crime led directly to the murder of his beloved Uncle Ben. The last line of the first Spider-Man story, "With great power comes great responsibility", has echoed down through his career, as he continued for years to try to atone for that one refusal to act. The other kids continued to pick on Peter, although they adored Spider-Man. With newspaper editor J. Jonah Jameson, it was the other way around — Jameson loved buying pictures from Peter Parker, but hated Spidey, and used his position to crusade against the wall-crawler. Driven by guilt and harassed from all sides, Spider-Man would have been better off if that radioactive spider had bitten someone else. Ditko (who is also responsible for Marvel heroes from Doctor Strange to Speedball) left the character in 1966, but Lee stayed on. 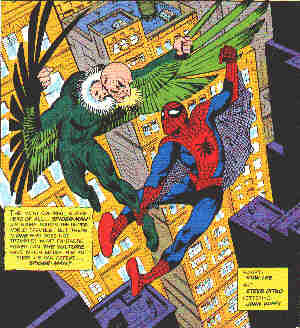 He no longer writes comic books, but since its inception in 1977, has scripted the Amazing Spider-Man newspaper strip. Peter Parker gradually matured and found a niche for himself in the social milieu. Meanwhile, Spidey assembled a typical Rogues' Gallery of regular villains, including Dr. Octopus, The Vulture, and The Green Goblin. He graduated from high school in 1965, and eventually from college as well. A milestone in Spidey's personal odyssey occurred in 1973 when his girlfriend, Gwen Stacy, was killed during one of his battles with The Green Goblin. The Goblin himself was dead one issue later, but since then, other super villains have used that name. Gwen was only one of several girlfriends Spidey had over the years. He kept coming back to Mary Jane Watson, whom he'd met in 1966, and married her in 1987. Along with several other Marvel characters, including Captain America and Iron Man, Spider-Man became an animated cartoon character in 1966. These productions used very limited animation, and are not fondly recalled today. The character was again animated in 1995, when Fox Kids Network took him on as a companion to their popular X-Men cartoon. This time, production values are much higher, and the show has a better fan following. In 1977, Spider-Man was made into a live-action TV movie, as part of an attempt to market several Marvel characters, most successfully The Incredible Hulk. to television. But that live-action Spidey was not well received, and is now mostly forgotten. It was another quarter-century before he was successfully done in that medium, but when Spidey's blockbuster hit the screen in 2002, it made up for the lack. Meanwhile, on T-shirts and lunch boxes, as an action figure and a character in occasional prose novels — and, of course, in cartoons and comic books — he didn't seem held back by the delay in big screen success. Text ©2000-08 Donald D. Markstein. Art © Marvel Comics.